Is rock bottom the only way to go? Okay, I know the answer is no. But sometimes it seems like the majority of successful writers now and throughout history had to hit their own personal rock bottom before they could truly write what was in their heart. And, to be honest, I’m worried that that might be what it takes for me to personally write the story I was meant to write. And it’s scary because I’m at a place in my career, and in my life, where I can’t imagine throwing everything away and starting over from scratch. Why are these thoughts of failure-driven greatness coming to mind? Because I recently ordered J.K. Rowling’s new book, Very Good Lives: The Fringe Benefits of Failure and the Importance of Imagination , and the only reason she was able to find the words to write the story in her heart (you may have heard of her books….something to do with a wizard and what not), is because she had nothing else left to her name. She had hit her own personal rock bottom and the only thing left to do was to write the story inside of her. It’s inspirational. It’s a feel-good story. I just hope it’s not the only way to achieve greatness. I know that in my personal life, the ability to learn from mistakes and even fail greatly, at times, has lead to growth. Do safety nets do more harm than good? But what I worry about is that I always have a safety net. That story idea not working out so well? No big deal. Brush it off and just keep pressing forward with the 9 to 5 work. Eventually, you’ll figure it out. Right? Well, what if I just never figure it out because I know I’ve always got a safety net? Is it only possible to write the story that’s in me if I take that safety net away? That seems like a terribly rash decision. Sure, if I was forced into leaving my job, maybe I’d see things differently. But I don’t WANT to leave my 9 to 5 job. I like the things I do when I’m not writing creatively. It’s a different side of me. A side of me that has figured out a couple things and is thriving in that environment. But I also want to write stories. And stories are hard…and yet mushy…and seemingly always just out of my reach. Yesterday, after my son FINALLY went to sleep, I took out my working second draft and opened to where I’d left off editing. The story seemed slow, to that point. Slow and derived and just really not good. Could I do that? Could I let the safety net win? It’s so comforting and so alluring. And I don’t just mean metaphorically. I actually felt instantly sleepy and then five minutes later actually went to sleep. If this story can only come by hitting rock bottom, then maybe it’s not worth it. I just really hope that’s not the case. Is it safe to geek out about tigers? 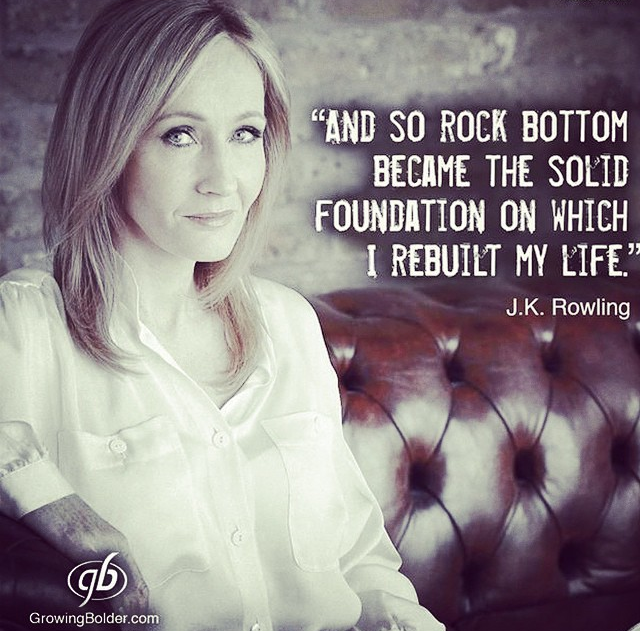 I’m not sure that the majority of successful writers had to hit rock bottom before finding their story. I think that path is more interesting than just “I had a thought in my head and I wrote about it”, so writers like to share their rock bottom tales. And we remember it because, again, it’s interesting. I’ve heard many writers say that they had to walk away from a draft, sometimes for years, sometimes while they worked on other books, before going back and finishing it. But since I know absolutely nothing about writing a book and can only assume the amount of blood, sweat and tears you’ve put into your writing, that might be a depressing (and possibly insulting?) suggestion.